Jewish King of Yemen, 515-525. According to the Arabian historians the name "Dhu Nuwas" was given him on account of his curly hair (Ibn Khaldun, "Prolegomena," p. 311; Ḥamzah of Ispahan, "Annals," i. 133). Von Kremer connects the name with a fortress "Nuwash" in southern Arabia ("Süd-Arab. Sage," p. 90); but the Arabic derivation is substantiated by the name "Masruk," given him in the Syriac translation of John Psaltes. In Greek sources he is known as δουναáν (acc.) or δουναáç (nom. ); while the name found in John of Ephesus has been explained by Von Gutschmid as the Greek τῶν ἐξω Ιυδῶν. In Ethiopic accounts he is called "Phineas." If the contradictory and sometimes legendary accounts of the personality of Dhu Nuwas given by the Arabian writers can be trusted, he was not a Jew by birth, but embraced Judaism after ascending the throne, taking the name of "Joseph." Having killed the debauched usurper Khani'ah Yanuf Dhu Shanatir, who endeavored to maltreat him, Dhu Nuwas successfully propagated Judaism in Yemen. His zeal for Judaism brought about his fall. Having heard of the persecutions of the Jews by the Byzantine emperors, he retaliated by putting to death some Byzantine merchants who were traveling on business through Himyara. This destroyed the trade of Yemen with Europe and involved Dhu Nuwas in a war with the heathen king Aidug, whose commercial interests were injured thereby. Dhu Nuwas was defeated (521), but succeeded in reestablishing his kingdom. Soon, however, he entangled himself in a new difficulty. He made war against the Christian city Najran, in Yemen, which was a dependency of his kingdom; and on its capitulation, in spite, it is said, of his promise of immunity from punishment, he offered the citizens the alternative of embracing Judaism or being put to death. As they refused to renounce their faith, he executed their chief, Ḥarith (Aretas) ibn Kaleb, and three hundred and forty chosen men. This event caused a great stir among the Christians; and the Roman emperor Justin I. requested the Negus Eleṭbaa of Ethiopia to march against the Jewish king. Accordingly an Ethiopian army crossed the Red Sea to Yemen. Dhu Nuwas endeavored unsuccessfully to prevent its landing. The ensuing engagement terminated disastrously for Dhu Nuwas. His city of Zafora (Thafar), together with his queen and the treasure, fell into the hands of the enemy. Preferring death to capture, Dhu Nuwas rode into the sea and was drowned. The chief authority for these facts is the Syriac letter of Simeon of Bet-Arsham, which is found in the histories of John of Asia, Pseudo-Denys of Telmaḥre, and Zacharias, the best edition of which is that of Guidi ("Reale Acad. dei Lincei," 1881). Grätz, Pretorius (1870), George (1883), Halévy, and Pereira have thrown doubts upon the authenticity of the narrative, which has also found its way into the "Martyrium Arethæ." Halévy, especially, has tried to prove the apocryphal character of this letter, because of certain contradictions which it contains, and has endeavored to show that it was written at the time of Justinian and not of Justin. The consolatory epistle written in 519 to the Himyaritic Christians by Jacob of Serug ("Z. D. M. G." xxxi. 402 et seq.) merely speaks of their persecution, and says nothing about the conversion of the king. John Psaltes, Abbot of Beth Afthonius (d. 538), wrote a Greek hymn, which was afterward translated into Syriac, in which he speaks of the persecutions, but does not in any way mention the Jews. Neither Cosmas Indicopleustes, who was at Adulis when the Christian King of Aksum, Eleẓbaa, was preparing his expedition against the Himyarites, nor Procopius, the historian of Justinian's wars (d. 565), mentions the events at all. L. Duchesne, while accepting Halévy's criticism of the letter of Simeon, still holds to the historicity of the general facts, as do also Nöldeke and Dillmann. Glaser ("Skizze," p. 534) suspects that the stories told in regard to Dhu Nuwas' cruelties are pure fictions. Mohammed knew the story (sura 85); it is mentioned in the celebrated South Arabian "Ḳaṣidah" (see the ed. of Von Kremer, p. 20, Leipsic, 1865), and by the Himyarite Nashwan ibn Sa'id in his "Shams al-'Ulum" (D. H. Müller, "Süd-Arab. Studien," p. 8, Vienna, 1877). 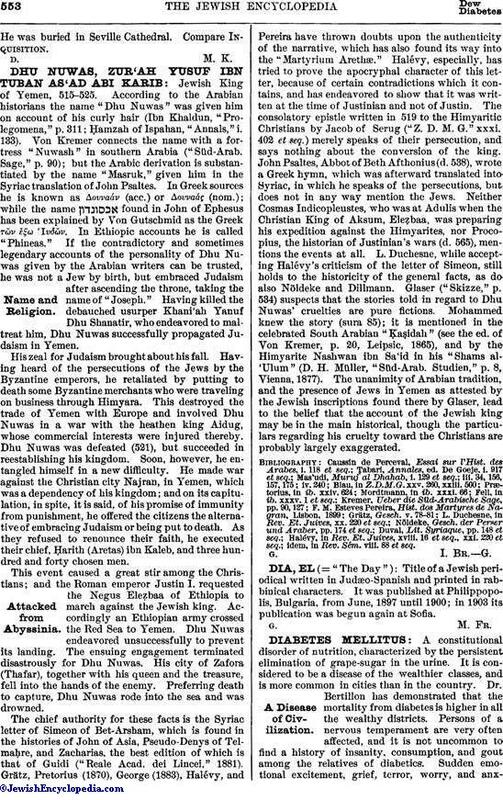 The unanimity of Arabian tradition, and the presence of Jews in Yemen as attested by the Jewish inscriptions found there by Glaser, lead to the belief that the account of the Jewish king may be in the main historical, though the particulars regarding his cruelty toward the Christians are probably largely exaggerated. idem, in Rev. Sém. viii. 88 et seq.